This section provides a tutorial example on how to use javax.swing.event.MenuKeyListener, menu key listener interface, to catch events fired by JMenuItem objects when a key is typed on the keyboard. menuKeyTyped(MenuKeyEvent) - Event handler method called when a key is typed on a menu item button. You need to implement this method to perform your own task. menuKeyPressed(MenuKeyEvent) - Event handler method called when a key is pressed on a menu item button. You need to implement this method to perform your own task. menuKeyReleased(MenuKeyEvent) - Event handler method called when a key is released on a menu item button. You need to implement this method to perform your own task. getSource() - Method returns the JRootPane object where the event occurred. Not very useful. getKeyChar() - Method returns the character represented by the key that triggered event. getKeyCode() - Method returns the code value represented by the key that triggered event. getKeyText() - Method returns the text name of a given key code value. getPath() - Method returns a list of menu objects representing a path in the menu tree. The last object is the JMenuItem object that fired the event. I declared the main class with "public class MenuKeyListenerTest implements MenuKeyListener" to make the main class objects as MenuKeyListener objects. "myItem.addMenuKeyListener(this);" statement is used add the MenuKeyListener to all JMenuItem objects. "JMenuItem item = (JMenuItem) path[path.length-1];" statement is used to get the last object from menu object path provided by the MenuKeyEvent object. When the "b" key was pressed, 4 menu key events were fired, 1 from each menu item that were active on the window at that time. 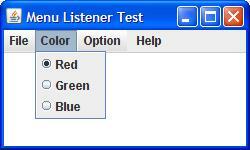 "Red", "Green", and "Bleu" menu items were on the "Color" menu opened by the mouse click. "Help" menu item was listed on the menu bar. When the "b" key was typed, 3 types of menu key events were fired in the order of "key pressed", "key typed" and "key released". The "key typed" event fired by the "b" key can not return a value key code, This is strange. When the "Shift" key is typed, no "key typed" event was fired. This is also strange.